On the evening of February 15th 1931, four journalists were invited at the London offices of the Producers Distributing Company, an American film distributor. They were introduced to a young engineer by the name of Eric Allan Humphriss, who had just recently joined the company. Previously, Humphriss had been working for RCA on their Photophone sound-on-film technology. The Photophone system produces a variable-width sound track, in which sound waves are represented by a black and white trace of varying width. The other approach to optical soundtracks, variable-density, has ripple-like patterns of varying opacity on the sound track. In both approaches, light from the projector shines through a slit before passing through the sound track. Depending on how much of the sound track is obscured, the amount of light that reaches a photoreceptor will fluctuate, producing an audio signal. One of the significant features of the variable-width approach is that it leaves a trace that is somewhat more legible to the human eye than variable-density ripples; different sounds leave distinctly different marks. While the optical patterns of the sound track originate from someone speaking into a microphone, wouldn’t it be possible to make ink markings directly on film, or to photograph visual motifs to make sound? It appears that the notion of manually drawing a sound track was an obvious idea that was waiting to be found. Indeed, it occurred to several people at more or less the same time. In the Soviet Union, the composer Arseny Avraamov, the inventor Evgeny Sholpo, along with the animator Mikhail Tsekhanovsky, working on the first Soviet sound film, The Plan for Great Works (The Five Year Plan) – dir. Abran Room, were struck by the ornamental nature of the variable-width sound track. It seemed obvious to them to attempt to draw a sound track by hand. Tsekhanovsky wondered if hidden music could be heard by photographing ancient ornaments onto the soundtrack. Precisely the same idea occurred to the German animator Oscar Fischinger, whose experiments in “sound ornaments” were preceded by fellow German Rudolph Pfenninger’s hand-drawn music. In all cases, it was the musical potential of drawn sound that appealed to the inventors above. Eric Allan Humphriss, however, was interested in the spoken voice. It is almost certainly during his time at RCA that Humphriss had the idea of improving, or correcting, the sound track manually. After what must have been long hours of studying the “peaks and valleys” of optical sound tracks, Humphriss claimed he became able to readily recognize the shape of the various sounds of the English language, to the point where he was able to read a sound track just like one would read a book. Whether this claim was exaggerated or not, it did lead him to attempt to not only read, but also write, in ink, spoken text. The four journalists who were led to Humphriss’ office were there to witness the result of his experiments. Humphriss had chosen the phrase “All of a tremble.” On a strip of cardboard, forty feet long, he painted in ink the wave form that would speak those words, which he then photographed onto the sound track of a blank film. He claimed that the whole task took him about 100 hours, but that having done it once, he could now repeat the experiment much more rapidly. The journalists were apparently impressed by the demonstration. They praised the natural English accent of the “robot voice,” and the articles they wrote were widely published. The Associated Press and the Central Press syndicated the story throughout North America, while the report that appeared in the New York Times is the most often quoted. The London Daily Express, however, ran the lengthiest article, on its front page, no less. A deep bass voice it was, clear as a bell, sufficient to please the ears of any Oxford don. “All . . . of . . . a . . . tremble . . .” it said. There was silence. The “robot” voice had spoken. It was terrifying for the moment, almost horrible. I felt a tingle down my spine. I had heard a voice that was not a voice, words that had never been spoken. Humphriss told the reporters that on the next day he would start work on creating a female synthetic voice. In fact, it may not be unreasonable to assume that this was the true reason of his joining the Producers Distributing Company. In the following years, a few newspaper stories reported a curious application of Humphriss’ skills. 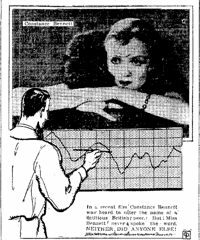 The story went as follows: a new “talkie” starring Constance Bennett (the leading female star in Hollywood at the time) was scheduled to be shown in London. However, because the name of one of the characters happened to coincide with that of a real British peer, the film failed to pass censorship. Since there was no time to have the actors re-record the offending lines, Humphriss was called in to paint in, by hand, a different name, in Constance Bennett’s “own” voice. This story appears to have been fairly well-known at the time. For instance, in a 1933 article, film columnist Alice L. Tildesley wrote: “Some of you may have read of the cardboard voice bestowed on Connie Bennett by a young magician in England.” Despite the story being relatively well-circulated, the details were always quite vague. What was the movie? Who was the British peer? This is never mentioned. In all likeliness, the film in question was titled “Born to Love.” The story was set in England and starred English actors such as Paul Cavanagh, without any doubt it would have been expected to be a hit in London. Indeed, it was shown for several weeks in at least three London theatres, which was more than any other Bennett film that year. One of the characters in “Born to Love” was named Lord Ponsonby, and there was indeed a British peer by the name of Arthur Ponsonby, who, as a writer and politician would have been known to anyone in London at the time. “Born to Love” was produced by RKO-Pathé, which had adopted RCA’s Photophone technology and its films were distributed in England by the Poducers Distributing Company. It would not be surprising that Humphriss was hired by the Producers Distributing Company with the express purpose of working on the “Born to Love” soundtrack. It is, after all, somewhat odd that a distribution company would hire a full-time sound technical supervisor, as he was credited. Indeed, in the following years he was appointed as production manager. Eric Allan Humphriss’ obscurity is in part due to the fact that the New York Times mis-reported his name; he was introduced as EA Humphries, a spelling that was copied in every subsequent text that mentioned his experiments. Humphriss is, however, the correct spelling, as attested by several documents, such as his birth and death records, the Daily Express story, his patent, and entries in the British Film and Television Yearbook. Humphriss, E. A. Improvements in or relating to sound recording film cameras. Great Britain patent GB549315, November 16 1942. Viking Films Ltd.